Since the early beginnings of the Land Art movement in the 1960s, artists have installed land art works anywhere in the world, placing them from high up in the mountains to deep below the sea. Deserts, in particular, have provided artists with space and natural materials to create and exhibit new works. For artists who live and work in urban environments, space is a luxury. And so it comes to no surprise that so many of them have taken to some of the most barren landscapes across the globe to live out their creative projects, often in dramatic scale. Creating and installing art in the ‘middle of nowhere’ desert has become an American phenomenon and a right of passage for many land artists, in particular. The American continents combined have some of the largest non-polar deserts in the world, ranging from the Chihuahuan, Colorado Plateau, Great Basin, Mojave and Sonoran deserts in the north, to the Atacama and Patagonian deserts in the south. Linked with a greater tendency to fund private and public art projects than other continents, this makes for the perfect breeding ground for desert land art works. Europe, on the other hand, doesn’t have near as many deserts and most African and Asian countries lack the funds to commission frivolous art projects that not many people ever get to see. Most donors — and rightly so — are hesitant to fund artworks that are inaccessible and don’t directly engage with the public — particularly if they are publicly funded or need to generate commercial interest and sales. Oceania’s somewhat conservative art scene, at least until now, hasn’t been able to greatly contribute to the desert art scene either. Nevertheless, over the years, many different artists have installed works in deserts around the world, contributing to this art movement in their own unique ways. Here are some examples. When filmmaker and sculptor Nancy Holt completed her breath-taking Sun Tunnels in Utah’s Great Basin in 1976, she created a work of art to transform our perception of place, space and time. Her purpose was to draw our attention to the relationship with the landscape we inhabit. She integrated her outdoor installations with the natural landscapes on which they were built and promoted environmental conservation and activism. Visit the Utah Museum of Fine Arts’s website to find out more and plan your visit to Sun Tunnels, here. More recently, in 2013, Phillip K Smith III took to the desert to build his Lucid Stead, for which the artist modified an abandoned, 70-year-old shed with mirrors to create a beautiful optical illusion. K Smith III also fitted the shed with changing LED lighting, which would change colour throughout the evening and night. He wanted to incorporate the idea of the desert landscape changing its light and colours throughout the day. While the meaning of the work remains slightly opaque, the artist manages to draw our attention to and highlights the desert landscape in an innovative new way, combining nature and man-made objects. K Smith III’s later work, The Circle of Land and Sky, 2017, similarly draws our attention to the desert landscape and creates space to reflect by placing an alien sculptural object within a familiar natural environment. There are, of course, exceptions to the ‘American desert rule’. At the beginning of 2019, Namibian-German artist Max Siedentopf set up a solar-powered sound installation entitled Toto Forever in the Namib Desert. He designed it to play on loop forever the soft-rock song Africa by Toto. The artist placed six speakers attached to an MP3 player in an undisclosed location somewhere in the 55-million-year-old desert, promising that the artwork would run “for all eternity”. Aside from the beautiful imagery, which the work creates with its white pillars set against the voluptuous desert landscape, questions around the depth and purpose of the artwork remain. Michael Harriot, Staff Writer at The Root, rightly describes Africa as “the whitest song ever”, and it remains difficult to tell how the artwork pays true homage to Africa, which Siedentopf seems to have set out to achieve. If anything, the white artist’s white art work echoes Namibia’s colonial past, imposing something on the African landscape without in any way engaging with the country’s geography or culture. At best, the work acts as an environmentally unfriendly publicity stunt to promote the artist and disregards the desert landscape by using it as a land art dumping ground. But other artists have taken more suitable approaches. More than twenty years earlier, in 1997, D.A.ST. Arteam installed its monumental Desert Breathland art work in Egypt, 8,000 kilometres away. Created through a collaborative effort between Greek installation and land artist Danae Stratou, industrial designer Alexandra Stratou, and architect Stella Constantinides, Desert Breath was designed “as an exploration of infinity against the backdrop of the largest African desert”. A feat of artistic engineering and construction, the art work took 9 months to complete. Visitors were then able to experience the piece by walking through the installation but wouldn’t only understand the scale of the piece until walking away farther from the site to see the piece in its entirety. The work was developed to contrasts our human scale with the size of the desert in a beautiful way, and although the desert has taken back much of the work since then, it still remains partially visible even more than twenty years after its completion. Another “Non-American” artist working with and in the desert, although he should probably not be described as a land artist, is Zhao Zhao. In 2015, almost forty years after Nancy Holt completed her Sun Tunnels installation, the Chinese artist launched his Project Taklamakan. 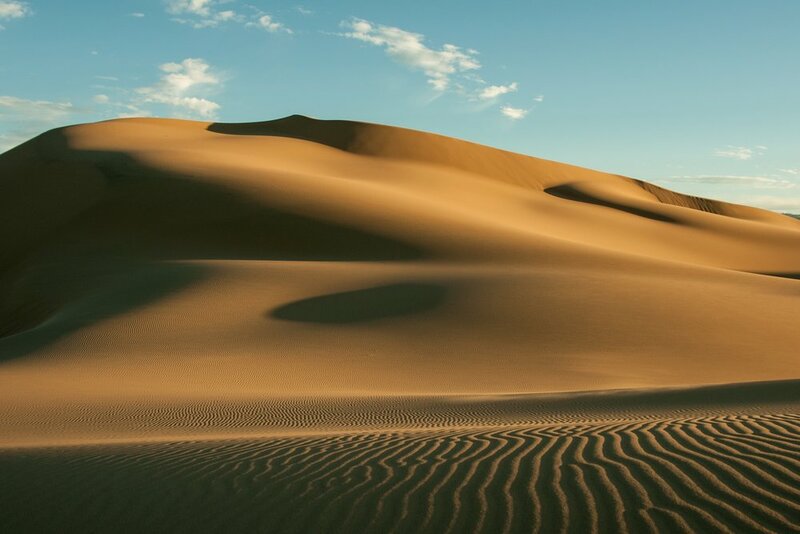 Travelling 4,000 kilometres from Beijing to the centre of the Taklamakan Desert, the artist connected a 100-kilometer-long electricity cable with a rural family’s power and installed a double-door refrigerator stocked with beer on a sand dune in the middle of … you guessed it … the desert. Zhao Zhao’s work creates an incredible contrast between man and nature and highlights the artists cultural upbringing and background, as he returns to his hometown for the first time in a decade. The specific discussion between man and nature which Zhao Zhao creates with Project Taklamakan would not have been possible in any other site or landscape, against any different background, and so the artist’s work perhaps more closely aligns with early land art pieces than many others. John Gerrard, who is normally based in Dublin and Vienna, also finds inspiration in the desert, and takes us back to the US, at least digitally. His Western Flag digital animation depicts the site of the world’s first major oil find in Spindletop, Texas in 1901, now barren and exhausted. The artist recreates the site as a digital simulation marked by a flagpole spewing an endless stream of black smoke, running the video in parallel with the real site’s day and night hours in Texas; matching sun patterns, timings and the seasons. Initially commissioned by Chanel 4 and launched at Somerset House for Earth Day in 2017, the artwork has now made it back to the US, where it currently features as a site-specific installation in the Palm Springs desert as part of Desert X festival. Desert X is a contemporary art exhibition framed by the mountains and desert of the Coachella Valley, and designed to highlight site-specific artworks from murals and projections to sculptures and more. The festival’s artists raise important environmental and social issues ranging from fossil fuel use and rising sea levels to immigration and class divisions, letting visitors engage directly with artworks. Perhaps for the first time ever, too, we can see desert land art works being promoted to general audiences, using a range of media from podcasts to Instagram posts. And while it is important to create new interest and build new audiences, particularly outside traditional art institutions, we should be wary of the environmental impact that Desert X selfie-takers might have on the landscape when visiting these sites. At the same time, contemporary land artists might find new opportunities to engage new audiences and raise needed awareness around urgent environmental issues, be they site-specific or global.